Shez Sneakin Fast (center), under jockey David Martin, surprises post-time favorite Corona B Gone (inside) in the $13,600 Mount Hood Handicap (not black type) Sunday afternoon at Portland Meadows. PORTLAND, OR—FEBRUARY 3, 2019—A late rush and a head bob at the wire, under jockey David Martin, propelled Shez Sneakin Fast (17-1) to a nose victory over post-time favorite Corona B Gone in the $13,600 Mount Hood Handicap (not black type) Sunday afternoon at Portland Meadows. Shez Sneakin Fast's stablemate and half-brother, the multiple stakes-placed Sneakin Tr, finished a head back in the blanket finish to get third. The daughter of leading sire Heza Fast Dash completed the 400 yard course in :20.117 seconds, into a 5 mph headwind on a fast race surface, equaling 95 speed index. It was the sixth career win in 24 starts for the sorrel mare. 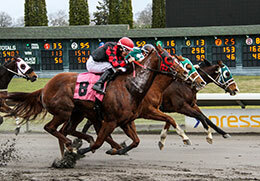 The $6,800 Mount Hood winners' purse pushes Shez Sneakin Fast earnings total past $37,000. Trainer Scott Raley conditions the Oregon homebred for owner Connie Chumbley. She was bred by Gary Chumbley from the Splash Bac mare Sneak Back and has compiled a (24) 6-6-4 record. Corona B Gone got away alertly at 3-5, under jockey Lorenzo Lopez, to earn $3,400 for second. Coming off a win in the Portland Meadows Championship Bonus Challenge in his last start, the Favorite Cartel gelding races for owner Ruben Magallanes and trainer Hector Magallanes. Bred in Oregon by Michael and Shannon McKay, Corona B Gone is out of Go Girl Gone by Shazoom. He has compiled a (10) 6-2-5 record while earning $66,574. Connie Cumbley's aforementioned Sneakin Tr, also trained by Raley, picked up $1,700 for third. The 8-year-old son of Tr Dasher, out of Sneak Bac, has earned $65,487. Robert Burney was in the saddle. Cm Once Ina Bluemoon, L Bar D Genuine Red, For Sweet Jess, Silvies and Flyin Rocks completed the field.